Swisscom and Sunrise fought to the finish about the pole position in our test of the Swiss networks. In this year’s competition, this resulted in a surprising outcome. “Outstanding“ is a grade that connect only awards rarely. Based on the 1000-point scheme of our mobile network test, it is only awarded for the impressive achievement from 950 points upwards. Among the Swiss operators, this award was achieved for the first time in our previous year‘s network test. Now, in the 2017/2018 season, there are even two Swiss operators who can be thrilled about this rare decoration. This tells a lot about the high level of network performance and quality in Switzerland. The little sensation may also be a consequence of the fierce fight about the top position in the test of the Swiss networks. In the previous year, Sunrise successfully took the first rank from the hitherto top dog Swisscom. The latter would not accept the defeat and threw itself onto improving its already high performance. But Sunrise acted similarly, and so both contenders managed to gain a considerable number of additional points in comparison to last year‘s results. The race of these extremely strong opponents was fascinating until the very end also for P3 and connect. Multiple careful evaluations of the results, accounted for a distinct tie of both contenders. And this happened on the highest level of points that was ever reached in a network test conducted by P3 and connect so far. Now Swiss mobile customers can be proud about even two “outstanding“ operators in their country. The quality and reliability of voice connections represent 40 per cent of the final score. Which operator offers the best network in this respect? Both Swisscom and Sunrise are well prepared for the battle in the voice discipline as they both support the modern voice connections according to the VoLTE standard. 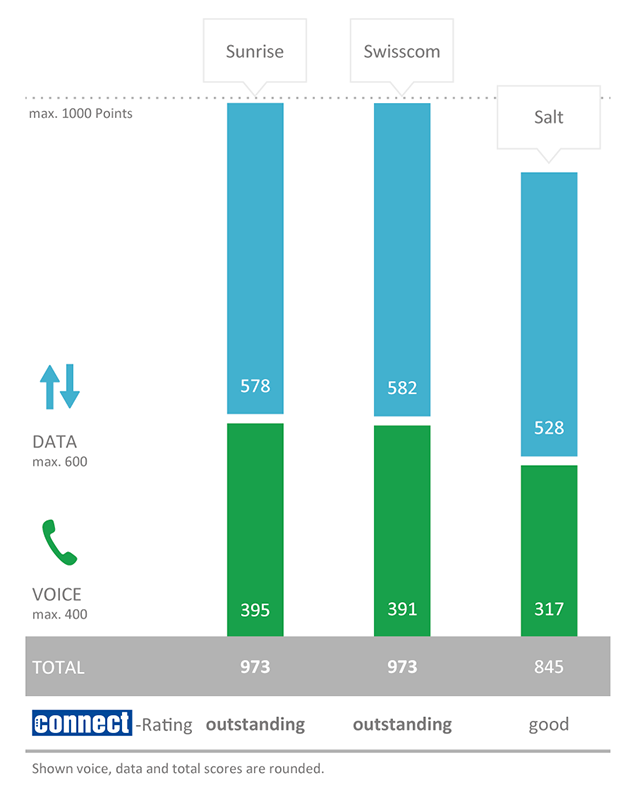 Only the third Swiss provider, Salt, still relies exclusively on the older circuit-switched telephony. The overall results show that Sunrise could gain a small lead over Swisscom in the voice discipline. But this competition takes place in the highest regions of achievable points. However, Salt follows at some distance behind the leading duo in all tested disciplines. As a matter of fact, VoLTE alone is no guarantee for excellent voice quality. But its abstinence from this technology seems to make it hard for the smallest Swiss provider to keep up with its two strong competitors in this category. More distinct weaknesses of Salt can be observed especially for phone calls on connecting roads and on trains. It must be emphasized that part of why this lag looks so pronounced is the unusual strength of the other two contenders even in these difficult disciplines. Data tests account for 60 per cent of the final score. Who delivers the best performance in this category? The overall picture in the data category is not much different than the one seen in the voice measurements. Again, there is little to no difference between the results that Swisscom and Sunrise achieve in our drivetests covering 18 larger cities and 35 smaller towns in Switzerland as well as approximately 5,100 kilometres of roads between them. The same applies to the walktests conducted in seven Swiss cities. In the data measurements, Salt again ranks a little behind the top duo, with the distance being somewhat less pronounced particularly in the drivetest scenarios. As Salt attacks the two bigger competitors quite successfully with aggressive tariffs, the distinct loss of points resulting from the walktests may indicate that this provider has to cope with capacity shortages at locations with a higher number of mobile users. In this clarity, however, this only applies to the walktest scenarios. The success ratios, reaction times and data rates observed in the data measurements conducted as part of our drivetests, on the whole are absolutely satisfactory in the Salt network. When we compare the third-ranking operators in each of the considered countries, Salts data performance scores behind T-Mobile in Austria but is clearly ahead of O2 in Germany. Once we take a look at the Swiss railways, we immediately stop making comparisons between the three countries – the insights would just be too frustrating. The performance especially of the leading duo simply plays in a league of its own. Only Salt loses some valuable points when we examine telephony on the railways. This comes somewhat as a surprise when we remember the convincing results in this discipline in last year‘s test. 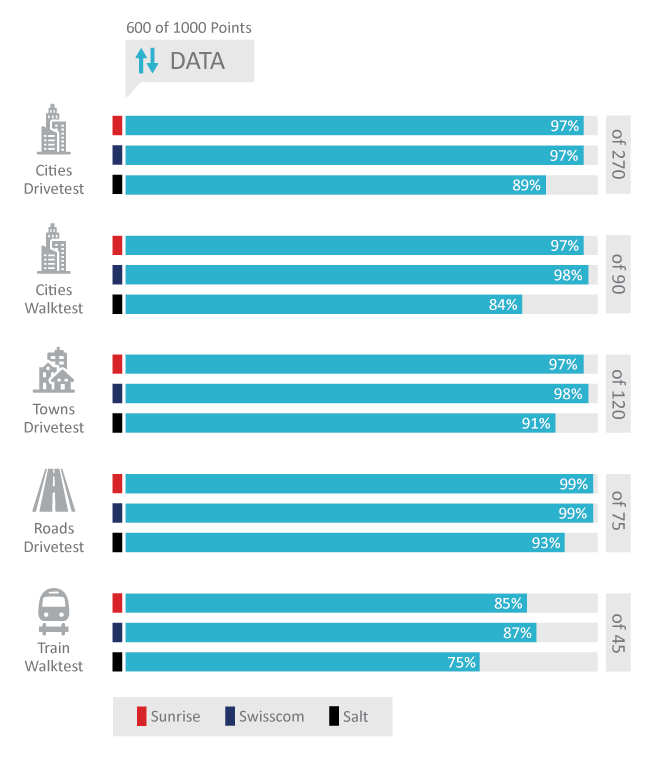 In the data tests conducted in trains, Salt also ranks a little behind the top contenders Sunrise and Swisscom. Nevertheless – achieving 75 per cent of the possible points in this discipline is still six per cent ahead of Austria‘s strongest provider and a whole 35 per cent ahead of the strongest contender in Germany. Mobile network coverage in Swiss trains simply is and stays unrivalled. The fierce fight over the best test results in Switzerland this year leads to a tie at the top position. As Sunrise is a little further up in the alphabet, we mentioned this operator first in our winners‘ list. When comparing the results directly with those of Swisscom, Sunrise leads by four points in the voice discipline but has to hand them back to its bigger rival in the data discipline. But there is no doubt that this result is truly “outstanding“. Great efforts after losing the top position in the previous year‘s test paid off: This time, the market leader Swisscom shares the winner‘s podium with its strong competitor Sunrise. Both networks deliver an impressive performance in this test. Swisscom is slightly ahead of Sunrise in the data evaluation, while the latter manages to take a small lead in the voice results. For these results, we sincerely send our congratulations to Swisscom too! Salt‘s overall results seem weaker than they actually are due to the contrast to its two “outstanding“ competitors. The smallest Swiss operator was still able to improve in comparison to last year‘s results in the data discipline. However, we observed some setbacks in the voice assessment – those are so distinct that Salt loses a total of 33 points and thus a full step on the grade scale over the previous year‘s results. Still, Salt fully deserves its grade “good”.